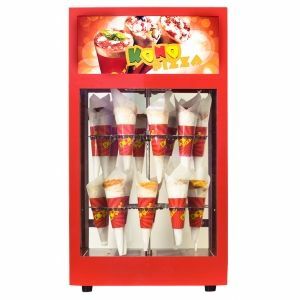 Kono Pizza Display Warmer with humidification is suitable for short-term storage and display of pre-made hot cone-shaped pizza. The internal temperature is adjustable from 30C to 70C. The warmer has a forced convection system and two revolving supports for cones. Each rack holds 15 cones. The supports have special pins for keeping the pizza's surface intact. The warmer has a lighting, wing doors and a bright lightbox with the KONO PIZZA logo. The frame is red painted. 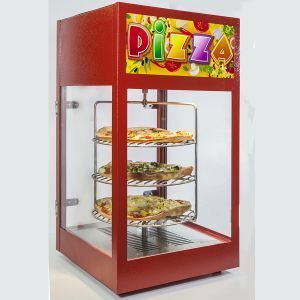 Pizza Display Warmer with humidification is suitable for short-term storage and display of pre-made hot pizza. The internal temperature is adjustable from 30C to 70C. The warmer has a forced convection system and three revolving racks for pizza. The shelf diameter - 330mm. The warmer has a lighting, wing doors and a bright lightbox with the PIZZA logo. The frame is dark red painted. 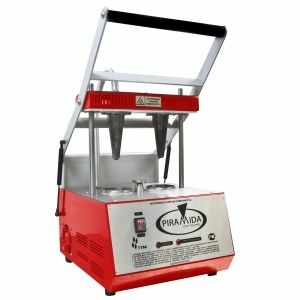 Kono Pizza Machine, semiautomatic, is suitable for forming and baking dough cones for pizza. Capacity - 2 cones. Preparation time - 60 seconds. The machine's top is lowered by hand and lifts automatically. Operating principle: an operator puts dough balls into the lower working mould and pulls down the upper mould by hand. After the set time is over the upper part lifts automatically and an operator removes the finished product. Then the cones can be filled with pizza's ingredients and can be baked in an oven or they can be filled with fresh ingredients and can be served immediately without baking. Completed with tongs. 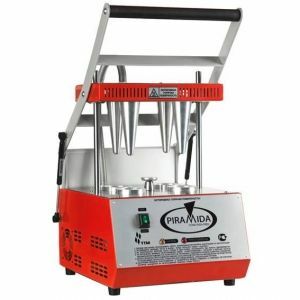 Kono Pizza Machine, semiautomatic, is suitable for forming and baking dough cones for pizza. Capacity - 4 cones. Preparation time - 60 seconds. The machine's top is lowered by hand and lifts automatically. Operating principle: an operator puts dough balls into the lower working mould and pulls down the upper mould by hand. After the set time is over the upper part lifts automatically and an operator removes the finished product. Then the cones can be filled with pizza's ingredients and can be baked in an oven or they can be filled with fresh ingredients and can be served immediately without baking.